A half-Russian, half-Korean rocket likely exploded a few minutes after liftoff Thursday, dealing a second blow the South Korea's $400 million program to develop its own satellite launcher. The Korea Space Launch Vehicle, or KSLV 1, blasted off from the Naro Space Center at 0801 GMT (4:01 a.m. EDT), or at 5:01 p.m. local time. The rocket flew through a nearly transparent deck of clouds about a minute after liftoff. Live video from the space center showed no signs of any problems during the early moments of the launch, but officials with the Korea Aerospace Research Institute say they lost contact with the rocket 137 seconds into the flight. At that point, the booster should have been flying between 40 and 50 miles in altitude on the power of a Russian first stage built by Khrunichev, the contractor in charge of the workhorse Proton launcher. Some Korean news reports say the rocket appears to have exploded and crashed as controllers lost communications with the booster. Nearly 375,000 pounds of thrust from the Russian-made first stage RD-151 engine was supposed to propel the 108-foot-tall rocket more than 100 miles above the East China Sea in less than four minutes. The KSLV's nose cone was expected to separate 215 seconds after liftoff. Khrunichev built the kerosene-burning first stage and lended expertise in construction of the Naro launch pad and control center under a 2004 contract signed with KARI. After pulling free of the first stage, the Korean second stage was programmed to coast for nearly three minutes before firing its solid motor for a 58-second burn to inject the flight's 219-pound payload into orbit. 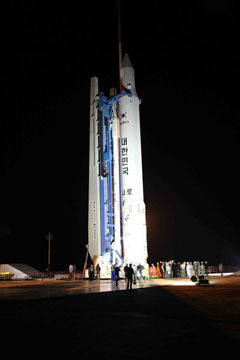 The launch was carrying the STSAT satellite with instruments to observe Earth and a laser reflector to help engineers track the craft's orbit. The rocket was targeting an orbit ranging in altitude from 186 miles to 932 miles, according to KARI. The rocket is nicknamed the Naro 1 after its launch site. South Korea has invested more than $400 million into the Naro rocket project. The flight was delayed one day after the launch pad's fire suppresion system unexpectedly activated during a countdown Wednesday. It was the second KSLV launch from the new space center, which was built 300 miles south of Seoul in the South Jeolla province near the southwestern tip of the Korean peninsula. 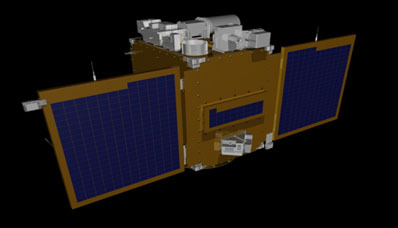 The Naro's first flight in August 2009 did not achieve orbit because half of its payload shroud clung to the rocket when it was supposed to fall away. The launcher tugged the extra mass into space, keeping the booster from reaching the planned orbit. Read our story on the KSLV's first flight. Engineers resolved the issue and started preparations for a second launch at Naro this spring. If the flight was successful, it would have put South Korea on a short list of eight countries, plus Europe, with their own space launchers. The flight was also a key test of the Russian first stage, which is similar to the rocket that will power Angara boosters off launch pads beginning around 2012. Russia is building the Angara rocket family to replace the Proton and smaller vehicles in the country's arsenal. Designers plan to cluster between one and five universal first stages to customize the Angara rocket for a range of payloads. Khrunichev is the Angara's prime contractor. South Korea says it wants to build a larger rocket to haul up to 3,300 pounds to a sun-synchronous orbit popular with Earth observation satellites. Officials want to use indigenous technology to achieve the goal by 2020. North Korea's state news agency had no official response to Wednesday's launch. Before last year's launch attempt, North Korea criticized the muted international response to the South's foray into the space arena. An apparent satellite launch attempt by North Korea in April 2009 drew reprimands from the international community, which said the launch was just a disguised long-range missile test. Tensions are high on the Korean peninsula after the sinking of a South Korean navy ship that killed 46 sailors in March. A South Korean investigation concluded the North torpedoed the vessel.